A year after just failing to sack Britain following a thrilling duel with Paul Nicholls, Willie Mullins will launch a concerted assault on the Punchestown festival in one final, desperate attempt to defend home territory and cling on to a title he has made his own. This time 12 months ago Mullins invaded what you might describe as Gordon Elliott’s patch, raiding Perth in the quest to plunder a first triumph for an Irish-based trainer in the British jumps championship since Vincent O’Brien’s incredible 1953 and 1954 successes. Having departed Aintree with a lead of £182,000, the ten-time champion trainer traded at odds of 1-10 to prevail. If only it were that simple. A lot has happened over the past year. Annie Power and Faugheen have been among the marquee names sidelined throughout, and Vautour was fatally injured in a freak accident. However, it wasn’t broken-down horses that contributed to the most consequential event at Closutton this term, but an autumn breakdown in relations between two people. When Michael O'Leary's irresistible force met Mullins's immovable object, the repercussions were of the nuclear variety. By then Elliott had already stolen a march in the championship. That in itself wasn’t unusual, but when O’Leary sent him the pick of Mullins’s 60 Gigginstown horses to take his contingent to 80, things changed irrevocably. The fallout constitutes the single most seismic shift on the Irish racing landscape in recent times. If Mullins last year briefly occupied Elliott's patch and adopted his strategies by venturing to far flung cross-channel destinations for modest rewards, now roles are reversed. Elliott did not even make an entry for Perth this week. Having watched the young pretender excel with former Closutton representatives such as Apple’s Jade, Outlander and A Toi Phil, Mullins faces a deficit of €382,155. Elliott has already – narrowly – relieved him of a fifth successive Cheltenham Festival leading trainer crown, and the man who last year came up short by less than £100,000 in the British championship when accumulating more than £2.3 million in prize-money this time sits tenth, yet to break the £1m mark. Aintree came and went without either man leaving a mark. As odds of 1-5 illustrate, Elliott is in prime position to deprive Mullins of a tenth championship in a row. However, we are in for a glorious crescendo. Punchestown’s five-day finale is a €2.9m extravaganza that Mullins has habitually farmed. 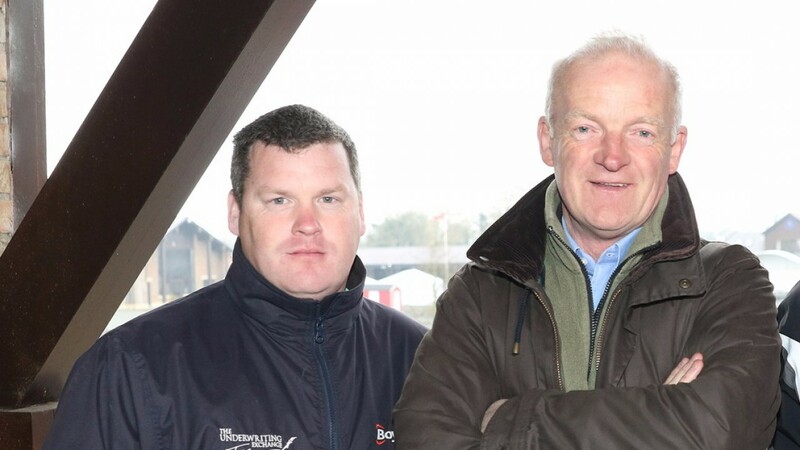 As we saw at Fairyhouse, making ground in the wake of Elliott’s ongoing momentum will not be easy, but Mullins plots for his horses to peak in the spring. He outscored Elliott 12-4 at last year’s festival, to the tune of €653,325, and departed with 16 winners in 2015. It will not be as lopsided this time, but the title race is not over. Of course, this week promises so much more than just a trainers’ showdown, not least the similarly engrossing joust between Patrick Mullins and Jamie Codd for the amateur riders’ equivalent. The Jessica Harrington and Robbie Power combination has been a revelation, and tomorrow their Gold Cup hero Sizing John will go toe-to-toe with the embattled Coneygree. Mullins relies on Djakadam in the Coral-backed Gold Cup, and he seems better equipped than Elliott in the four €250,000 Grade 1 features. Scrumptiously, the in-foal Annie Power is poised to return for what would likely be a swansong appearance, although whether she contests Thursday’s Stayers’ Hurdle, Friday’s Champion Hurdle or Saturday’s Mares’ Hurdle remains to be seen. Given her fragility and status as the finest jumps mare since Dawn Run, she will hardly run more than once, but we can expect a few curveballs, with Elliott revealing on Monday that Labaik - one of the opening-day stars - could well be declared for Friday’s Champion Hurdle, although there is water to flow under that bridge first. Among others, Supreme Novices' Hurdle winner Labaik will be reopposed by Mullins’s Supreme runner-up Melon in the first of the week’s Grade 1s, so we will not have long to wait before we discover what exactly the temperamental grey is going to do. Sometimes he starts, sometimes he doesn't. Un De Sceaux tends to leave less to the imagination. The hair-raising front-runner has become a flagbearer for Mullins, a flamboyant, free-going force of nature whose consistency defies his erratic tendencies. The nine-year-old is riveting to watch, pulverising the opposition at Cheltenham en route to an emphatic Ryanair Chase coup under Ruby Walsh. Given Un De Sceaux’s established superiority over Special Tiara, he would also surely have capitalised on Douvan’s Champion Chase capitulation. On Tuesday he reverts to what might still be his optimum trip when he tackles Melling Chase winner Fox Norton under the insatiable Power in the BoyleSports-sponsored showpiece. As will be the case over the next five days, fireworks are anticipated, and it could be that the first major blow isn't landed by either of the two heavyweight title contenders. One way or another, it all makes for an epic climax.